In the days of the apocalypse when the sky is being rolled back like a scroll, while the earth gives up its dead, you can be sure that mountains, too, will melt like wax. The terrible day of Judgement need not come so soon for many of us, since I am quite sure that there is still plenty that we have left on our bucket list. 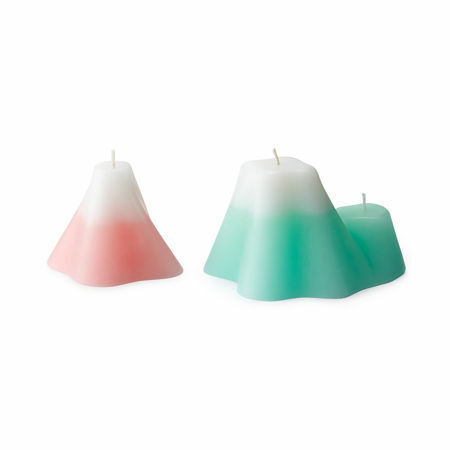 Having said that, why not have a “preview” of what melting mountains would look like in the form of the $15 Melting Mountain Candles? These fresh-scented candles will spring to life whenever you light their wicks where the stylized faces of Mount Fuji as well as the Himalayas come rendered in pale rose and soft teal tones, and each of them are topped with white brows evoking the ranges’ snow-capped peaks.